Jay Goltz started a picture framing business right out of college, a decision that was not the conventional wisdom of the times. See books featuring Jay Goltz. Jay Goltz started a picture framing business right out of college, a decision that was not the conventional wisdom of the times. The business grew quickly, and before long was twenty times the size of the average frame business - making it the largest in the country. Jay expanded into related businesses and now each of them is at the top of its field. 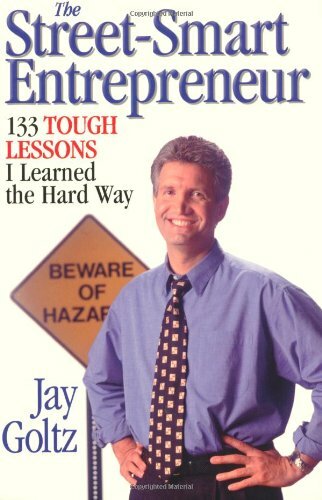 Realizing there was a lack of real-world advice for small businesses, Jay wrote his first book. The Street Smart Entrepreneur: 133 Tough Lessons I Learned the Hard Way has been translated into three languages. Now a popular speaker, Jay Goltz has become a voice of small business through his keynotes, New York Times blog and broad media exposure. Jay is widely recognized for his unique ability to bring clarity and insight to complex, often confusing, small business challenges. Keep up with Jay on his blog. You’re the Boss at NYTimes.com. This highly recommended book is full of sage insights for entrepreneurs and managers. Covering a range of topics which include tips on interviewing prospective employees, marketing and finance, successful entrepreneur Jay Goltz is insightful in his advice. With a table of contents and index, the book is constructed in an anecdotal fashion. Goltz waxes philosophical about a variety of subjects in a common format; he shares "What I Used To Think" and then "What Nobody Told Me" before summarizing his experience in a lesson - hence, the subtitle of the book. He is brutally honest. For example, in Lesson #38 he tells the entrepreneur that "You could be the worst person to do the hiring at your company." In Lesson #37 he shares his successful hiring experience in using the BATH test to make a good hiring decision. I found Goltz's Lesson #7 insightful when he concludes that "Two out of three ain't bad when you're talking about price, quality, and service." His Lesson #67 about giving year-end bonuses is instructive. There are many people with whom I'd like to share the insights in this book, but they'll have to buy a copy. I'm not giving mine away. Jay Goltz and his company, Artists Frame Service, are one of 14 featured companies in Bo Burlingham's book, "Small Giants: Companies That Choose to be Great Instead of Big". For all you harried entrepreneurs out there, Bo Burlingham has a reassuring message: Relax. Bigger isn't necessarily better. 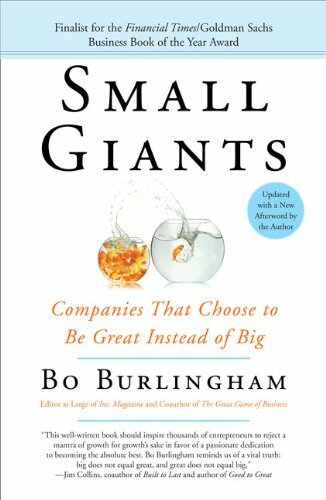 The wonderful stories in Small Giants show you how to prosper by retaining the vision of excellence that got you into business in the first place. It aims to do for small private companies what In Search of Excellence did two decades ago for big public companies: shine a light on a handful of business practices the author admires, and which he believes are the reason some companies consistently do better than others. Jay Goltz, CEO of Artists Frame Service, was singled out by Bill Clinton in his new book, "Giving", for his pro bono consulting work with the Urban Enterprise Initiative. Bookstore shelves are crammed with offerings by presidential candidates, but now we have the first book of the season by a candidate for first spouse. 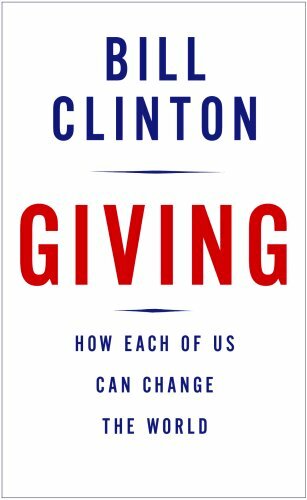 Bill Clinton titles his thin volume Giving because it extols the virtues of volunteering time and money to worthy causes. But it could just as well have been called Adjusting, as the former president seeks to define his new role while Hillary Rodham Clinton pursues his old office. "Now that we've switched places," he writes, it is his turn to influence events without government portfolio. And perhaps from a perch no man has ever occupied. In Giving, readers and voters in effect get a preview of what a Bill Clinton-run East Wing might look like -- focused on fighting poverty, disease and climate change around the world and rallying the mighty and the meek to noble goals.